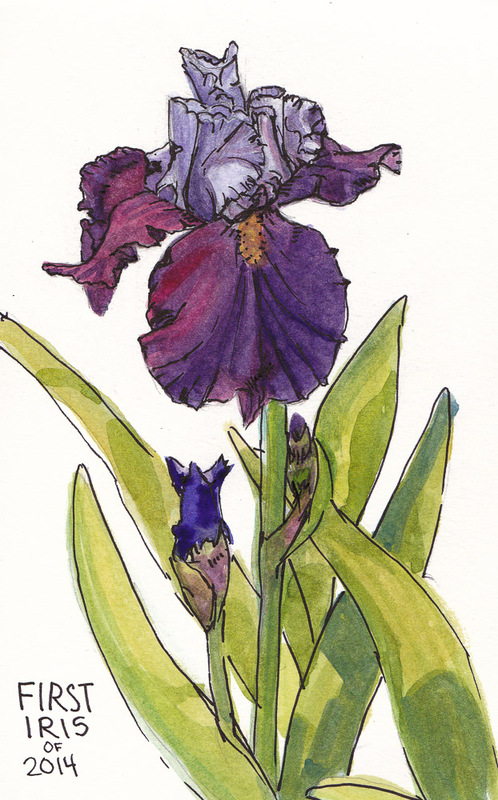 I put my sketching stool in my front garden to paint the one iris that decided to bloom this year. The past two years none of them bloomed and I think it’s because you’re maybe supposed to dig up the bulbs and separate them and plant them further apart when they get too crowded? Gardeners, your advice welcomed! I missed sketching the first blooming of my roses, when each rose is so perfect and beautiful it’s just heart breaking. I was “too busy,” putting it off one day too many and then the big rains came and the fresh perfect roses were no more. I really enjoyed drawing and painting while practicing close observation of the different shapes and structures of this amazing plant. Beautiful. I can’t wait to see mine. Beautiful! I know what you mean about the first roses…I just realized that mine will probably bloom when I am out of town. The iris is gorgeous. The colors are eye catching. Probably my favourite flowers – these are lovely! Thank goodness no more dog chews! What a beautiful Iris. We’ve started to have a few spring flowers pop up letting us know spring is here. Yay!